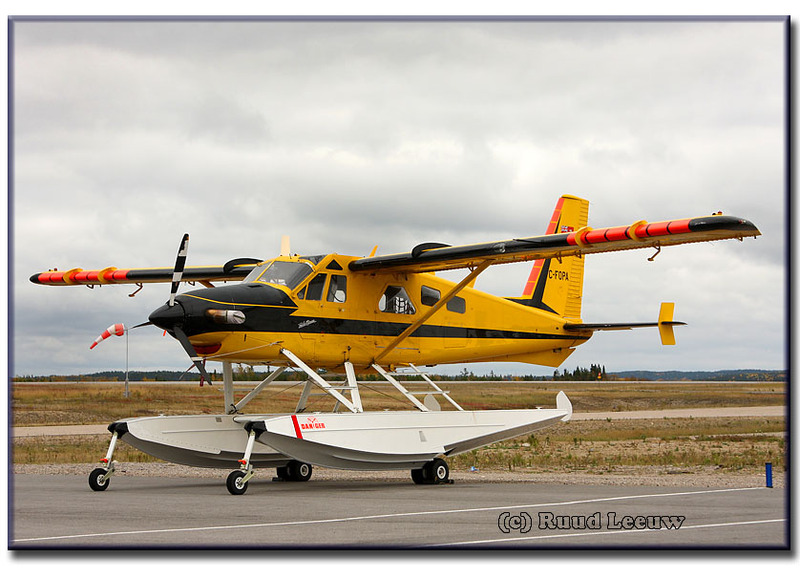 On this particular day, Monday october 1st, we drove from Red Lake to Sioux Lookout, stopping at Dryden for a look at the waterbombers. 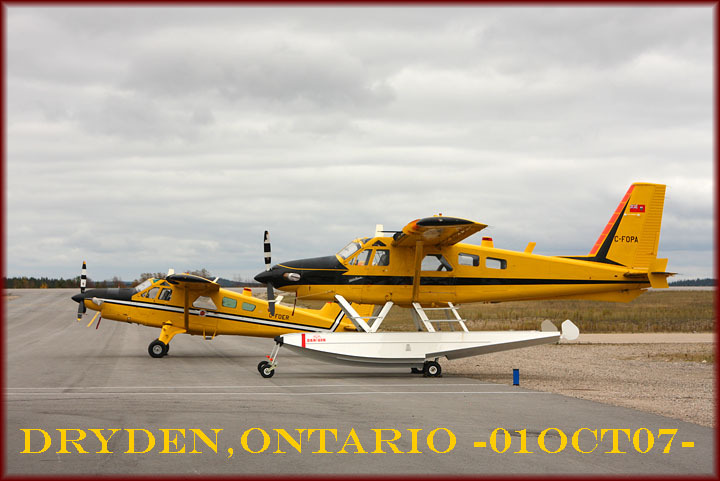 A fair distance outside Dryden is the Municipal Airport of Dryden; Dryden is the second largest city in the Kenora District of Northwestern Ontario on Wabigoon Lake. It is currently the smallest community in the province of Ontario designated as a city. I walked in the deserted terminal and asked permission to go out on the ramp; local aviation enthusiast Derek was there to meet me and told me the aircraft of the Ministry of Natural Resoures were temporarily parked at the terminal while resurfacing of their ramp was in progress. The airport has an informative website. 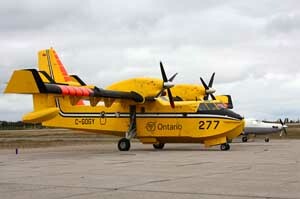 C-GOGY is a Bombardier CL-415 (CL-215-6B11, c/n 2040) and has been registered to the Province Of Ontario, Ministry Of Natural Resources since 09Jun99. The aircraft has been fitted with turbine engines. The Wikipedia website had the following on Bombardier: "Bombardier acquired Canadair after the Canadian government-owned aircraft manufacturing company had recorded the largest corporate loss in Canadian business history. Under the management of Laurent Beaudoin, Armand's son-in-law, Bombardier took over Canadair to form Bombardier Aerospace. Shortly after, de Havilland Canada from Boeing, the bankrupt Short Brothers and Learjet operations were added. The aerospace arm now accounts for over half of the company's revenue. Bombardier's most popular aircraft currently include its Dash 8 and CRJ lines of regional airliners. It also manufactures the CL-415 amphibious water-bomber and the Challenger business jet. 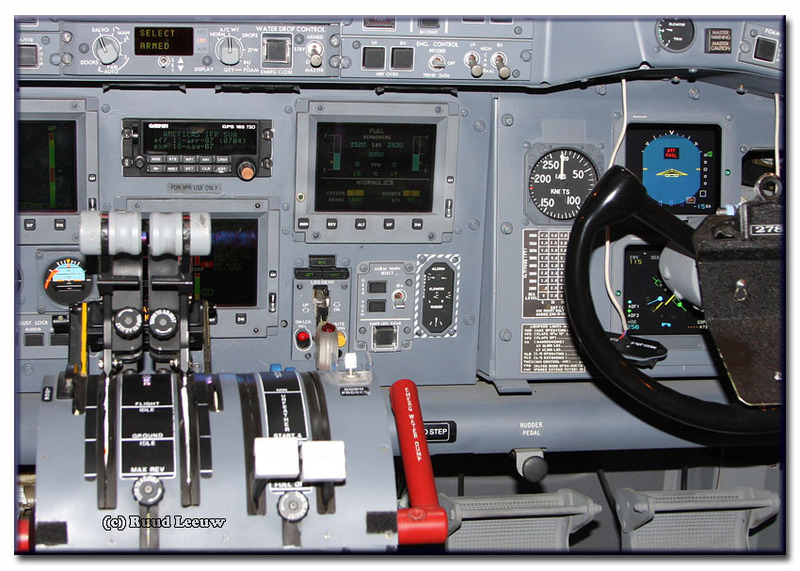 Learjet continues to operate as a subsidiary of Bombardier and manufactures jets under the Learjet name." 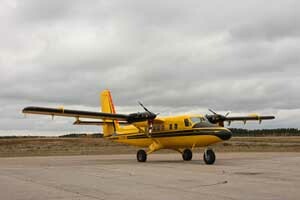 This is De Havilland DHC-6-300 Twin Otter C-FOPG (c/n 232) against the empty backdrop of northwest Ontario. The DHC-6 Twin Otter is a multi-purpose STOL (Short Takeoff and Landing) utility aircraft developed by De Havilland Canada. C-FOPG was registered to the Province Of Ontario, Ministry Of Natural Resources (Aviation and Forest Fire Management Branch) on 16May1969. C-FOER is a modified Mk.III DHC-2 Beaver, c/n 1671TB41, with a turbine engine. 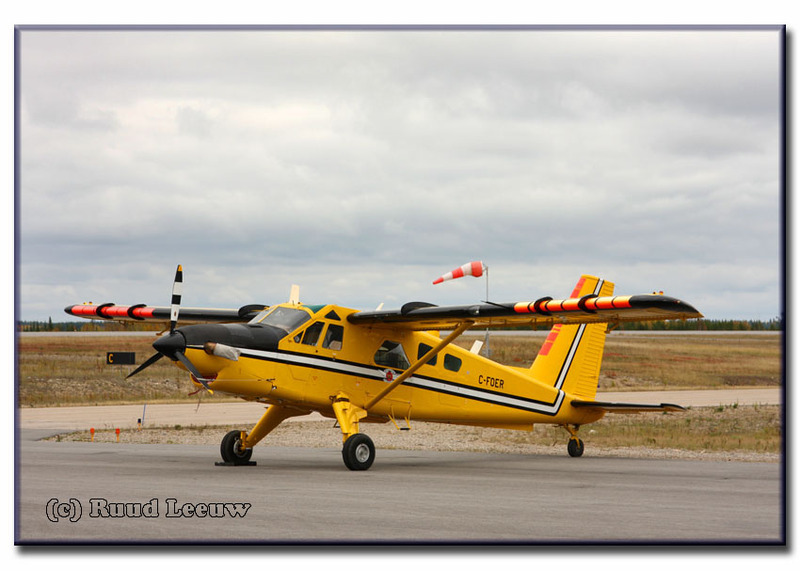 It was previously registered CF-OER and been in use by the Dept of Lands and Forests, but has been registered to the Province Of Ontario, Ministry Of Natural Resources (Aviation and Forest Fire Management Branch) since 28Jul67. 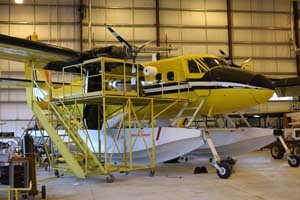 DHC-2.com has nice photos of C-FOER, including some while equipped with skis. Now this Beaver has all the trimmings...! 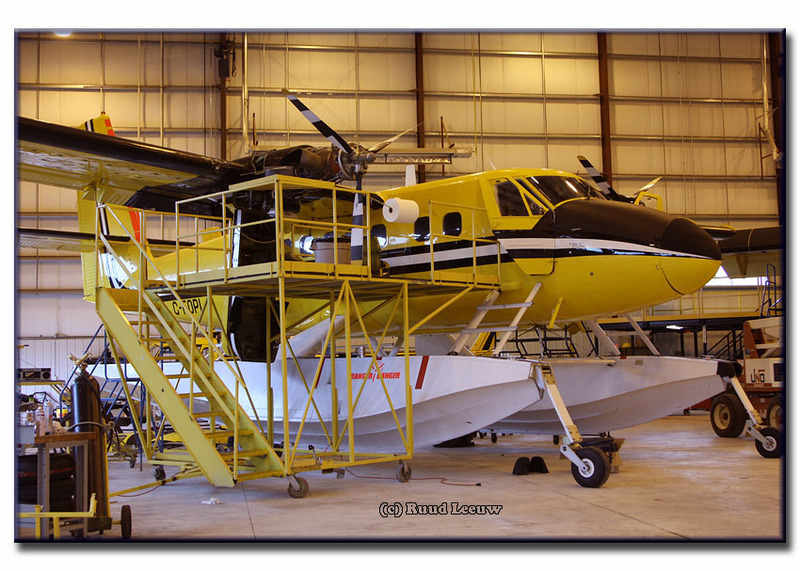 It has been put on floats and has been modified with a turbine engine. 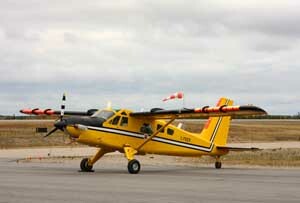 C-FOPA c/n 1688TB56 was registered to the Ministry of Natural Resources (its actual headquarters is at Sault Ste. Marie,Ontario) on 22Mar68. 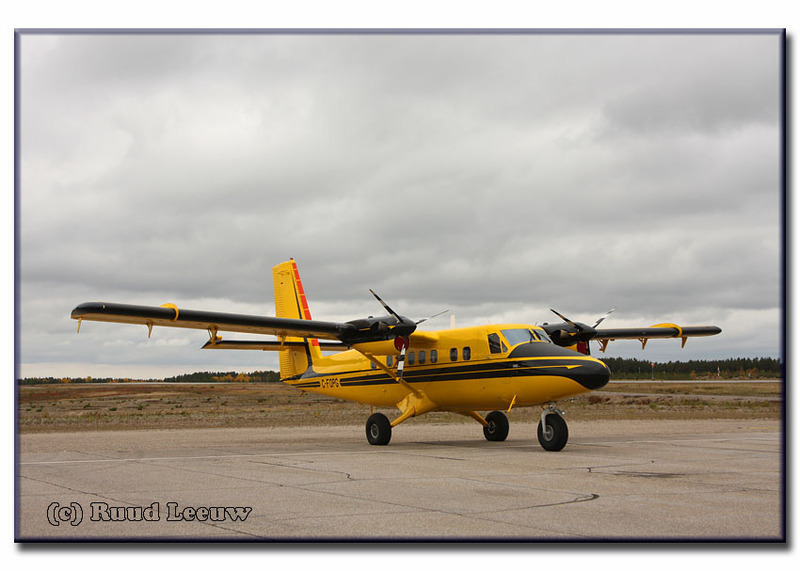 Ray Fread flies for the Ministry of Natural Resources (MNR) and photos of C-FOPA and other aircraft can be seen on his page. 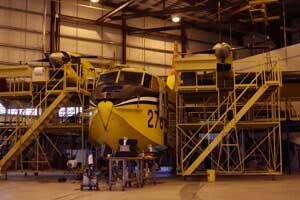 I was very pleased to be allowed to have a look in the maintenance hangar where several inspections were taking place. 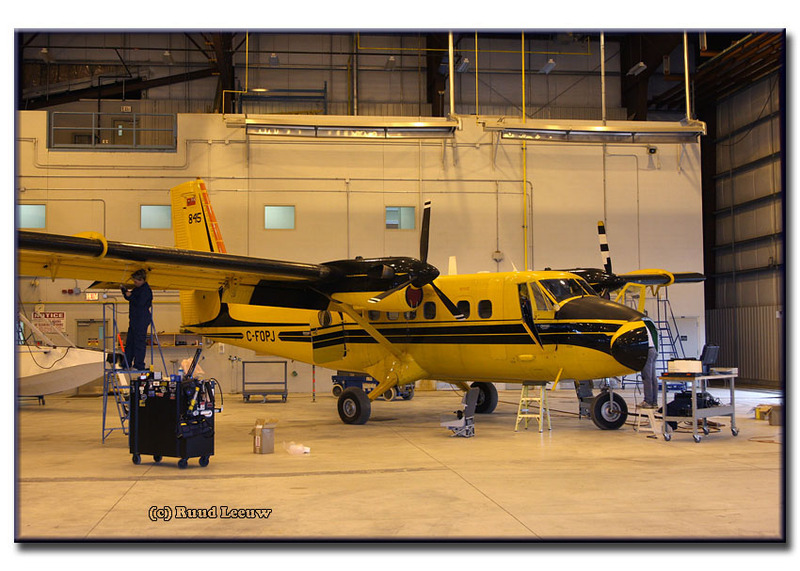 This is C-FOPJ, DHC-6-300 Twin Otter c/n 344, registered to the MNR on 19Jul72. 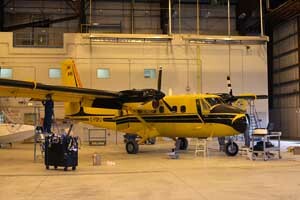 C-FOPI is another DHC-6 Twin Otter (Series 300), it has construction number 243. It was registered to the MNR on 29Jul69. On floats it is quite a huge plane! An even bigger aircraft is of course the Bombardier CL-415! 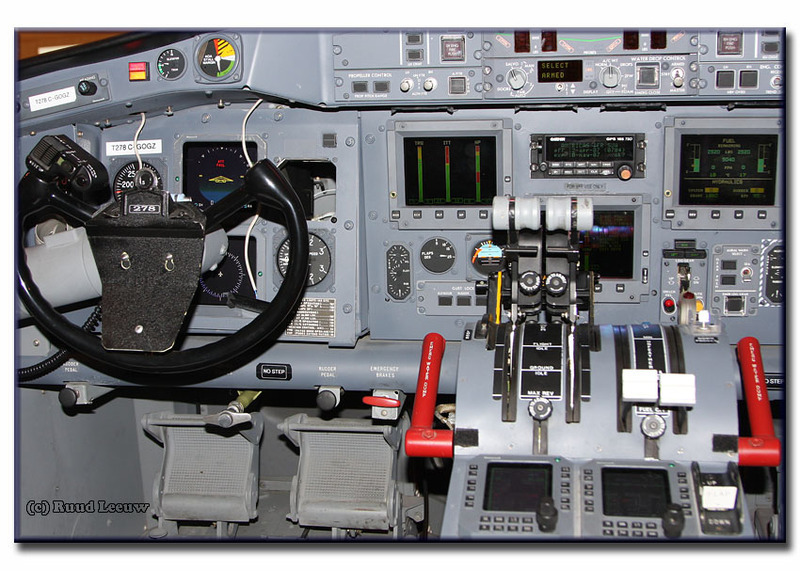 It is in extensive maintenance and an enthusiastic engineer showed me around in the cockpit, even going to the trouble of connecting it to an external power so the equipment in the cockpit came online! I felt I was getting a vip-treatment, much impressed! Tanker 278 is C-GOGZ, a CL-415 (CL-215-6B11, c/n 2043). It was registered to the MNR on 17Feb2000. 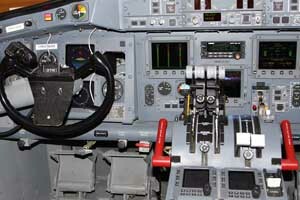 Below are images of the cockpit and the cabin. 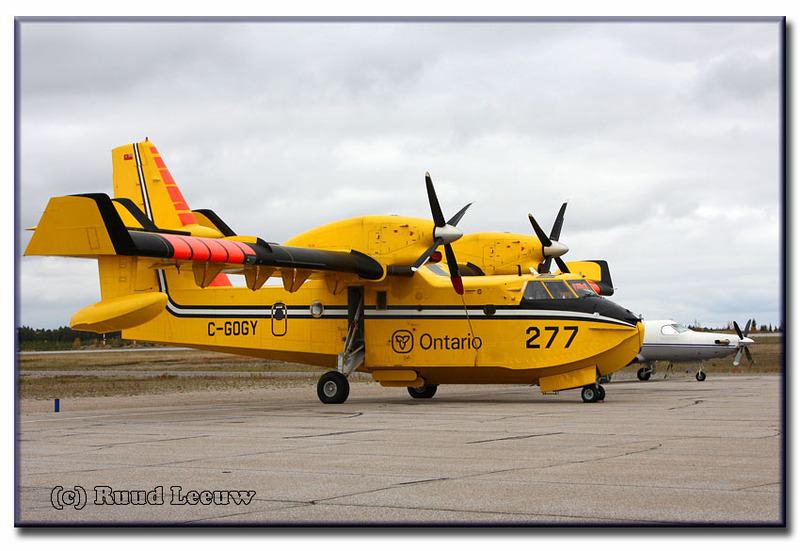 The Bombardier 415 (formerly Canadair CL-415)is a Canadian amphibious aircraft purpose-built as a water bomber, a Superscooper. 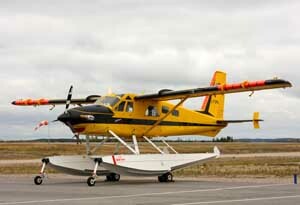 It is the only aircraft designed and built specifically for aerial firefighting and is based on the company's CL-215. 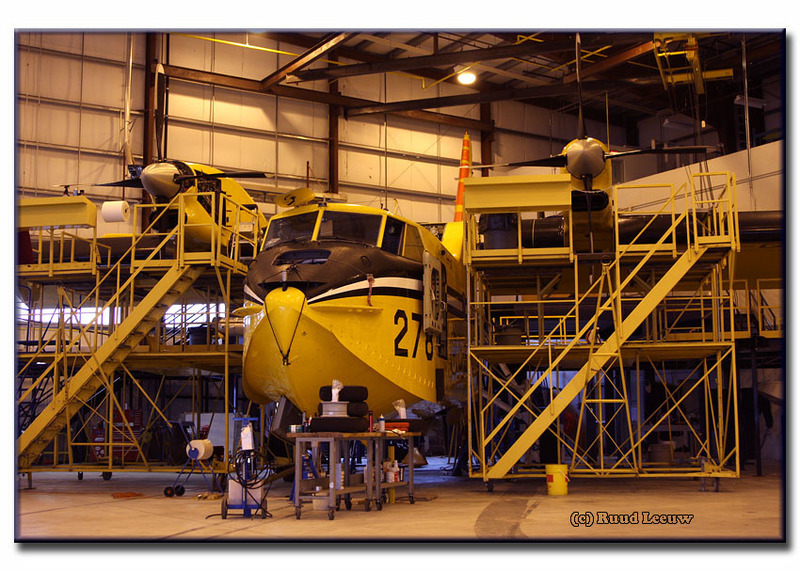 In 1987, following market trends towards more efficient, powerful and reliable turboprop powerplants, Canadair undertook the task of retrofitting a number of CL-215 airframes (17) with the Pratt & Whitney Canada PW123AF engines, providing a 15% power increase over the original piston engines. The retrofitted aircraft were designated CL-215T and also featured many aerodynamic and systems improvements including powered flight controls, cockpit air conditioning, as well as upgraded electrical and avionics systems. 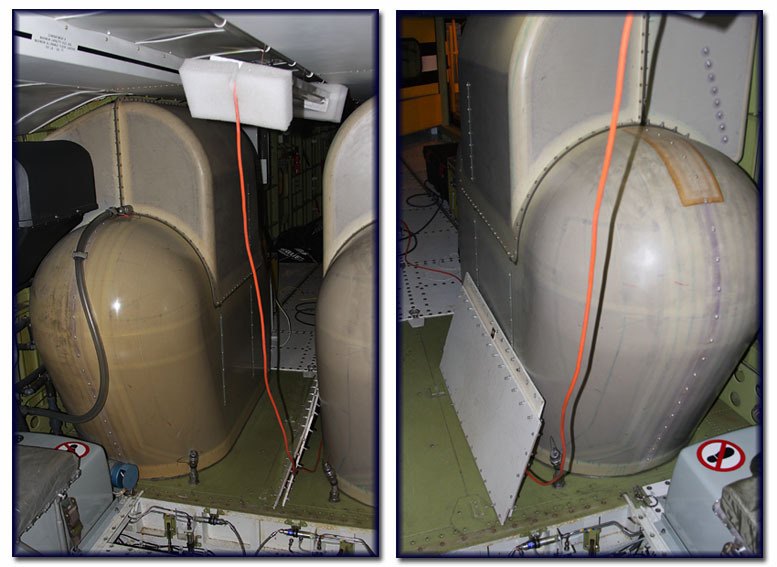 Aside from the powerplants, the most notable external features of the CL-215T retrofit were the aerodynamic additions to the wings and empennage. 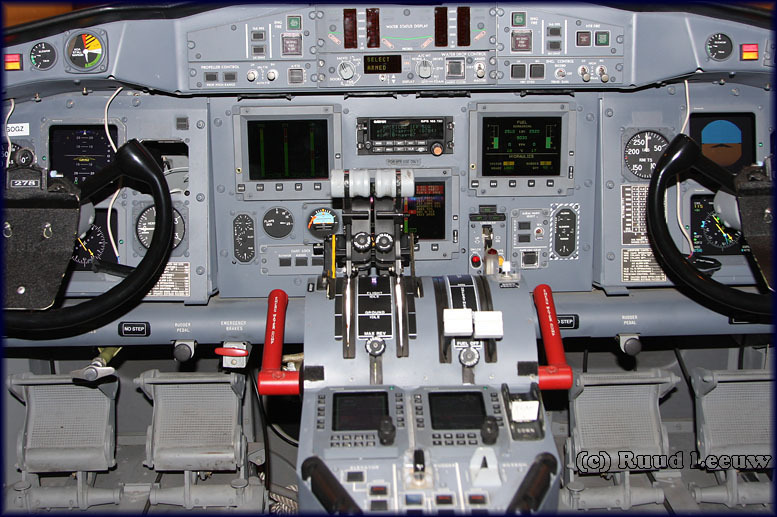 Based on the success of the CL-215, the CL-415 was subsequently a "new-build" production series beginning in 1993. 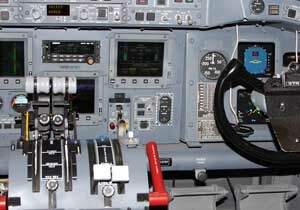 The 415 has an updated cockpit, aerodynamics enhancements and changes to the bomb system as well. Compared to the CL-215, the CL-415 has increased operating weight and speed, yielding improved productivity and performance. The CL-415 can scoop up to 6,140 litres (1350 Imperial gal or 1,620 US gal) of water from a nearby water source, mix it with a chemical foam if desired, and drop it on a fire without having to return to base to refill its tanks. Thanks to Derek and the engineers of MNR Dryden for their hospitality.